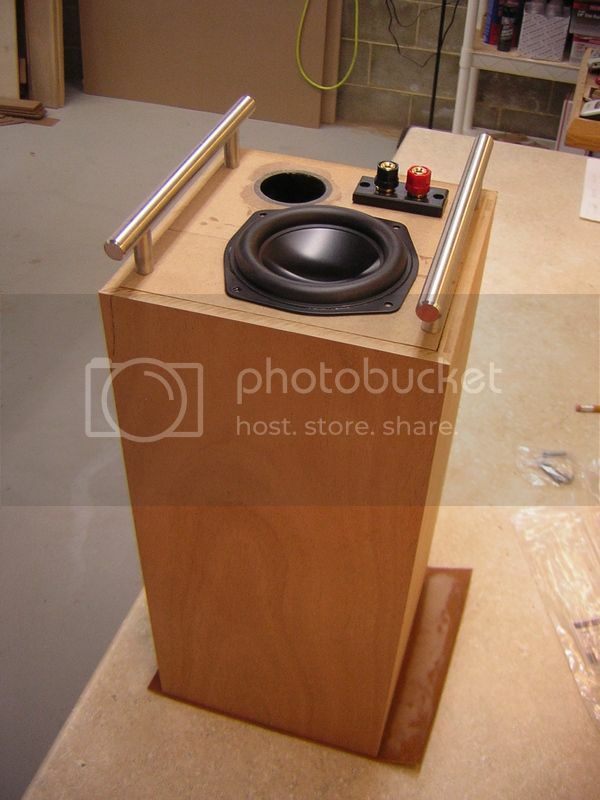 After I finished up my 'Micro-B' 2.1 amp project, I started thinking about which small subwoofers would be a good match for it. The 'Voxel' designed by Paul Carmody is probably the perfect choice I think, but I wondered what else would fit the bill... it had to be something equally small or smaller... and hopefully a little cheaper. That curiosity intersected with another curiosity that has been gnawing at me for an even longer time. For years I've been toying around with the idea of trying to turn a single ND-105-4 into a small subwoofer. I suspected it was too small for real subwoofer duties, but I was still curious. Each time I listen to Chris Roemer's Neo Nano's, I marvel at the bass they are able to put out for their size... If you've heard them, then you know what I mean. So eventually, my curiosity got the best of me. 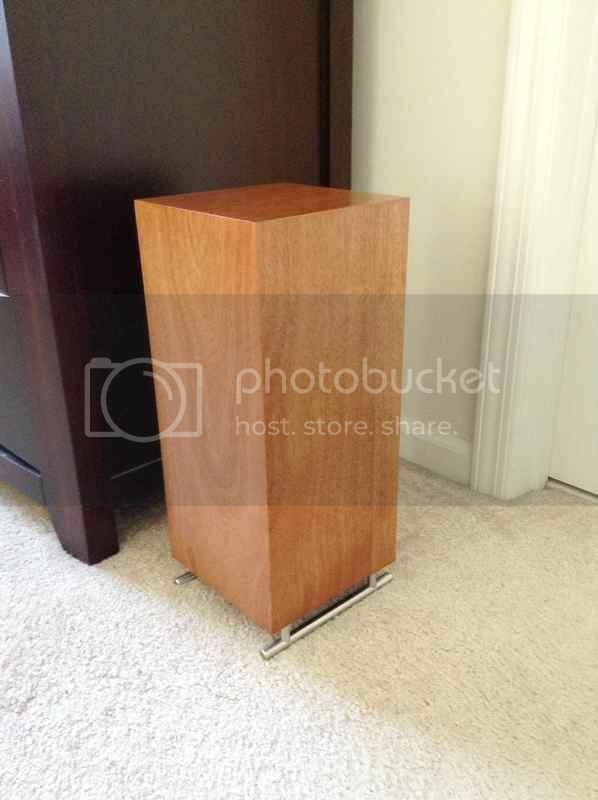 I modeled one in a squared-off tower design I'm calling the "Bass-ND". I was shooting for the ability to reproduce around 90 db at 35 Hz as a target... I listen to jazz a lot -- more modern stuff than traditional stuff -- and there is a good amount of low stuff in most of what I listen to, so I went with a longer vent to gain some additional lower bass at the expense of more volume in the 50-70 Hz region. That tradeoff seemed to suit my goals. I know the cone excursion is well past X-max at 35 Hz, but I think if you can live with some distortion down there, the cone will survive just fine when pushed within reason. I believe Chris allowed for a generous amount of excursion when modeling his Neo Nano's in part because of its huge X-mech stat, so I felt excursion was going to be outside of the 'damage' region. The box is 7" by 7" by 15.5" tall with a long 1.5" by 12" port. I made the sides and top with mitered corners to make it nice and strong and hopefully keep the veneer nice and smooth, I hate it when seams show through the veneer. I was running out of 1/2" MDF so I had to glue up some scraps for two panels to get enough to make this box with. There are no braces by the way, it doesn't seem like it needs it to me, the box doesn't vibrate at all believe it or not. I was planning on throwing a few dowels in after I fired it up, but it wasn't needed. 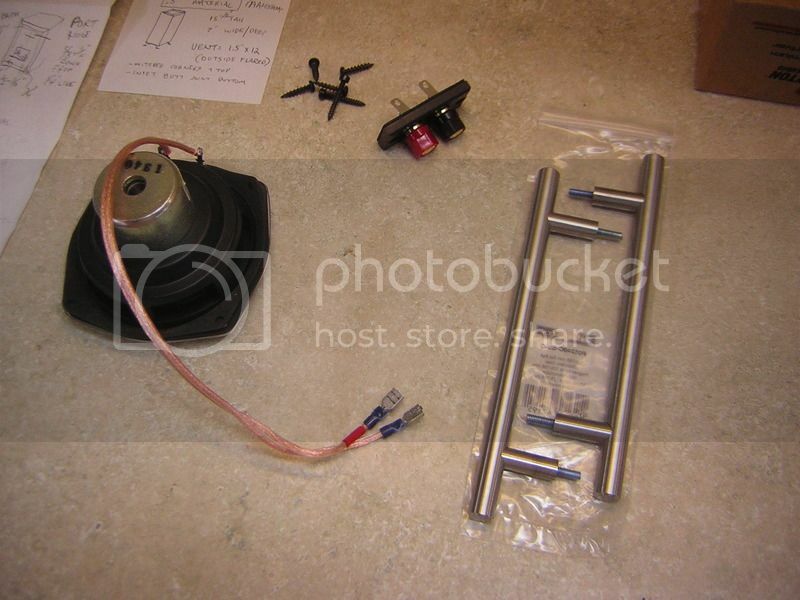 Here are the parts I used to build it: The ND-105, 4 ohm woofer, a binding post terminal, and a few large stainless steel drawer pulls. I thread-locked the mounting screws for the drawer pulls and then cut the heads off. 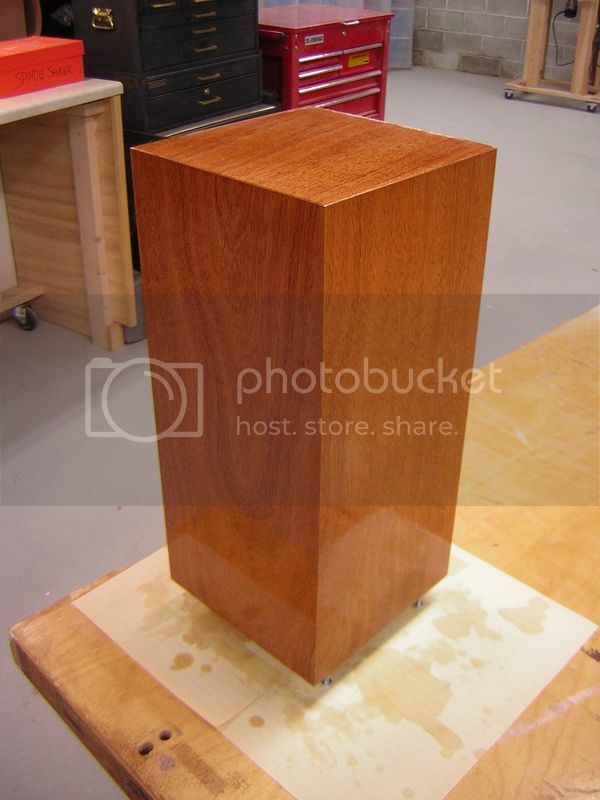 I then epoxied the threaded portion in pre-drilled holes in the bottom of the box. I also lightly stuffed the box with some polyfill, I guess just out of habit. I was going for a minimalistic avant guard type of look for this. 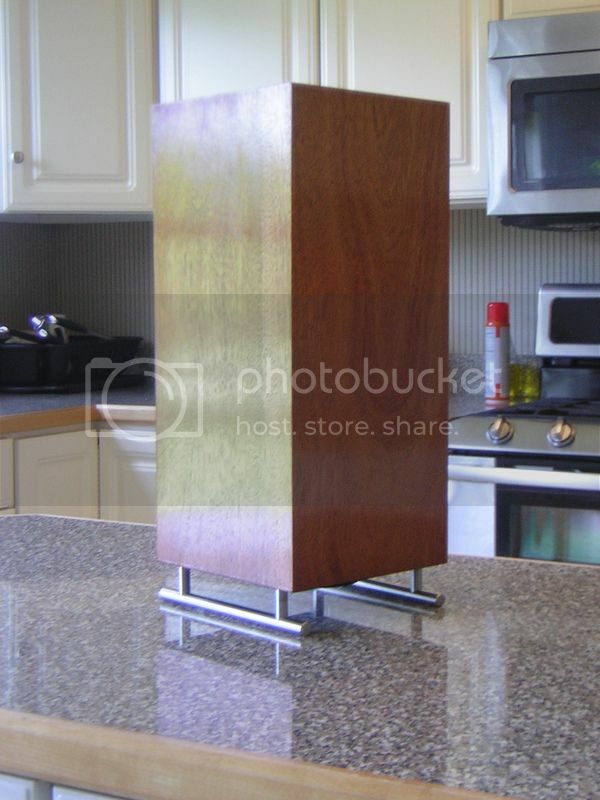 I chose Mahogany veneer which is kind of boring, but still has enough grain to be somewhat interesting. I couldn't put anything too fancy on it, I thought it would clash with the simple design/lines. It doesn't show in the pics, but it's very glossy, which adds a bit of pizzazz to the piece. I made a mistake originally; I always seem to make at least one! I placed the binding post on the bottom without noticing that it would be impossible to plug wires into them for lack of ground clearance. So some dowels were glued in those holes and it was moved to the rear of the box. The top and sides received 7 coats of rub-on gloss poly and the bottom was painted with Rustoleum 'painters touch' flat black paint rolled on. That stuff is awesome for a quick cover-up, it covers even MDF end grain, and dries in minutes. Here it is in its new home by my chest of drawers in our bedroom. It is now the acting subwoofer for my "Micro-B" 2.1 plate amplifier powered set of Jeff Bagby's Quark speakers which set on top of the chest of drawers. So, is it a real subwoofer? Honest opinion: it does a fairly decent job as a small subwoofer if you keep in mind that it's just a 4" driver in there and so it is limited in output down low. It has an F3 of 50.6 Hz, F6 of 38.5 Hz, and the F10 is 30.8 Hz but the slope is kind of shallow until around 30 Hz, then it dives steeply. The "Micro-B" 2.1 amp has a knob to control the subwoofer level, so I could tell as I turned down the subwoofer volume that it was really contributing to the overall 'depth' of the music. It didn't get as loud, or as low as the 'Voxel' subwoofer obviously, but it does seem to be efficient enough to keep up with the 'Quarks' volume wise to be a good match for them with this amp setup. Placed next to a wall, the bass filled in nicely in our large bedroom... in a corner with a bit more input power (I was using an old Kindle Fire as a source) I bet it would surprise. That's pretty much it for this project. I was curious like I said and wanted to give the little ND-105 a go just to see how it would do. It was fun to complete a quick project, as well as being a good thought exercise for a few weeks. I played with lots of box sizes, port lengths and various tunings for a long time before settling on what I had. A bigger box would have been better, but after consideration, I went as large as I was willing to go size-wise so that was kind of set in stone near the end...also, the tall shape allowed for an easy time fitting the long vent. Well, It was fun to finally 'scratch that itch' so to speak. Thanks for looking. Last edited by tomzarbo; 08-15-2015, 06:37 AM. Very nice Tom! I like it! I was always curious as to how low those little drivers could go! Way lower than their size suggests. Doesn't a downward firing sub and port cause issues? Wouldn't one get some sort of horn loading effect, depending on the height of the bottom of the box and the floor. It does alter response but at a frequency higher than subwoofers reproduce. 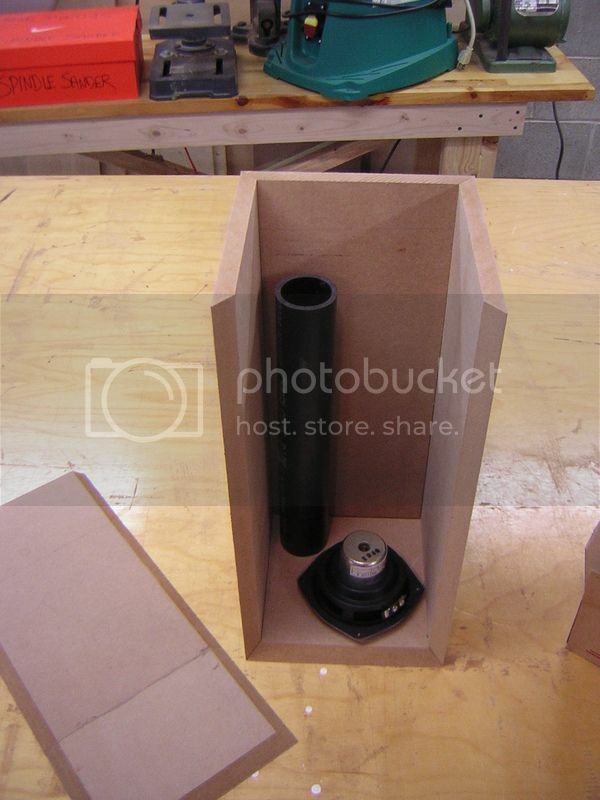 I would be more concerned about potential pipe resonances with the box shape and how tall it is. 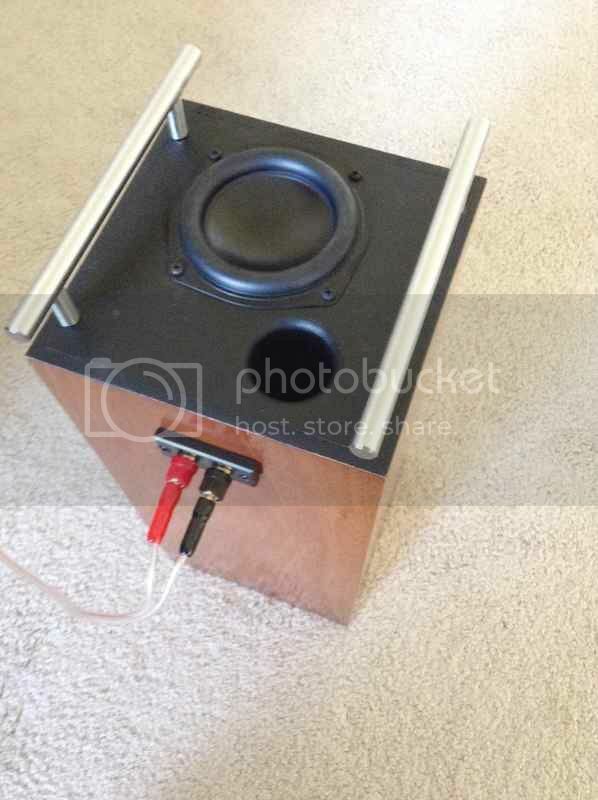 I'm sure Tom knows what he's doing and I'm sure it sounds suprisingly good for a 4" subwoofer. You spend WAY to much time in the Basement. Please find a nice Hobby to occupy your time. Do you realize that being an American is like winning the biggest jackpot ever?? 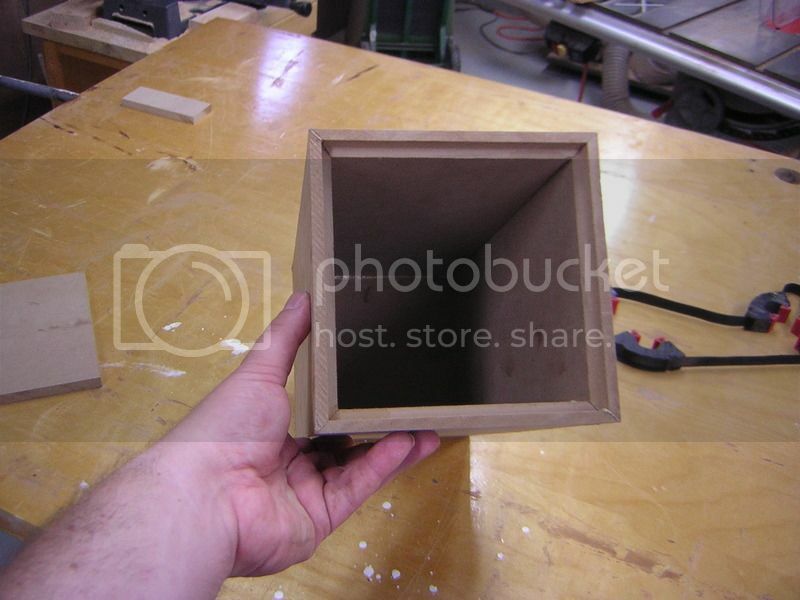 I am building a box tomorrow for two ND105-8 for my living room sub. I will eventually run them off of a Dayton 75w amp. This is a great project! Another great looking project Tom! The drawer pulls make cool looking feet. Top notch work like always. I think the Mahogany and satin feet compliment each other very well. Where do you get the black PVC pipe? Haven't been able to find it at my local Home Depot or Lowes. It's ABS drain pipe. Both Home Depot and Lowes carry that in my area up to 4". It is so common they probably carry it in your area too, just ask them. Maybe not- some states don't carry ABS due to plumbing codes not allowing its use. I can get it in OH, but not IN. Menard's carries polyethylene black pipe that is cheap and easily available. I got the ABS from Home Depot here locally. I like it because besides being black, it's a lot lighter than PVC pipe. I just started seeing it around these parts about 4-5 yrs. ago. Maybe like Wolf said, it was not okay per code around here until then. I've been in a habit of not using the flash, so I never seem to be able to capture the glossiness of the cabinet very well. Of course it is wet in this pic, but that's how it really looks under light. I have to listen to some more tunes on it to get a better idea of how it performs, and the driver is not broken in yet, but I'm liking it so far. It plays just low enough and just loud enough that it sounds like a real subwoofer -- but it's almost a tease in that respect... You're hearing good stuff so you want to crank it up louder, but you can only push a 4" driver so far. Right now, I can play the Quarks and this sub at full volume on my "Micro-B" amp and the sub is asking for more... but the source is an older Kindle Fire, later on I'll connect my laptop to the setup and see what it can do with that...I suspect the laptop will have much more output than that old Kindle. Cool build, Tom. I always enjoy looking at your stuff because you always seem to have some kind of really creative or unique addition to them. So I hooked up my laptop as the source with the "Micro-B" 2.1 amp and that helped a lot. I was able to drive the little ND-105 nearly to extinction... or at least until it made some funny noises. It never bottomed out, but got pretty close: to the point where it sounded goofy. But at the volume that we normally listen to music in our bedroom, it has no problem whatsoever keeping up with the rest of the music. I may try to find an equalizer app for the Kindle Fire that I'm running it with to get a little extra oomph down low... kind of like a "bass boost" button. Love this Tom! I purchased six of the ND-105-8's recently on sale. Anyone seen PE's home theater built into the stand product? I'm about to do my own version. Your experience here with this project is going to be a big help! This is really cool. Looks great, too! Do you have any in-room measurements? in war, victory . . . in peace, vigilance . . . in death, sacrifice. I don't have any measurements yet. Maybe in a day or two I can get to it. I'd like to see what it's actually doing as well. I'm busy now making cubbies for our classrooms. 12 sheets of plywood's worth! I'd like to actually try it with PE's 25 watt plate amp as well as PE's 2.1 plate amp, both of which would fit in this small cabinet.